Thanks to his dad, Elliot has been involved with things photographic since he was about 5 years old and working in his dads darkroom. His passion for the art and what can be created through photographic capture has grown stronger year after year. That is why he enjoys teaching and helping others expand their knowledge, so they can record their world in new, different and creative ways. Your images today can influence your world of tomorrow and tell your story in a way that nothing else can. And this is why he has created BLUE RIDGE WORKSHOPS. His dad, now gone at 95 years old, taught him a great deal about photography and it has been a most wonderful experience for Elliot to teach his dad digital photography. Just two weeks before his passing on August 10, 2011 he was shooting pictures with his Canon G10 and printing them on his Epson all in one printer. Elliot’s career, which spans over fifty years if I include his dads darkroom, has taken him into many different areas of the photographic world. He has been a portrait photographer, wedding photographer, photo journalist, nature and scenic photographer, architectural photographer, military photographer, and a recorder of memories and history in those capacities. 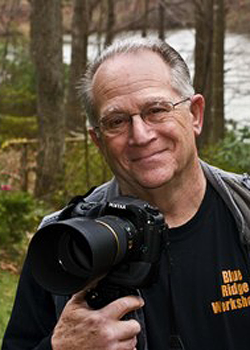 He has lectured, performed classes, and educated countless numbers of people about photography and digital workflow across the country and now wants to bring his experiences and knowledge to Blue Ridge Workshops. Over the years, while expanding his photographic knowledge and teaching experiences he had the good fortune to be associated with several manufacturing companies. One of those companies, which greatly influenced his career was Nikon, Inc. He worked for Nikon for 33 years, selling and teaching and it gave him the incredible opportunity to be in the forefront of the digital revolution and certainly gave him the opportunity to learn all of the new technologies and deal with all of the challenges that those technologies brought with them. Having dealt with all those challenges has helped him teach the concepts of digital imaging and digital work flow to a great many aspiring photographers. After retiring from Nikon, Elliot worked in the Photo Retail end of the business, always hoping to create a company like Blue Ridge Workshops which would allow him to do the things he loved most, which was shoot images and teach. While in retail he did very advanced classes on Nikon single lens reflex cameras, and digital workflow. Now he is in a position to form the Blue Ridge Workshops, and bring on some highly capable instructors with many years of experience like himself. The workshops for Elliot are very important. They will give him an opportunity to pass on his knowledge and experiences to others in a comfortable, easy to learning environment. By becoming the educator and bringing in other educators, each with their own particular slants on photography, he can finally achieve his dream, creating some of the best photography workshops available. Elliot’s current choice of equipment is Olympus Micro Four Thirds (m43) mirrorless thru the lens cameras and optics. He is also a big fan of the Olympus E-5 and Olympus Dslr lenses. That is why he feels so strongly about teaching photographers how to master their equipment and at the same time develop the right skills in photographic technique to produce incredible images.